InLace is a decorative material that can be used to create inlays in turned work, to fill natural voids in timber for decorative effect, or it can be cast into blanks which may be turned to make finials, pens or other small items. 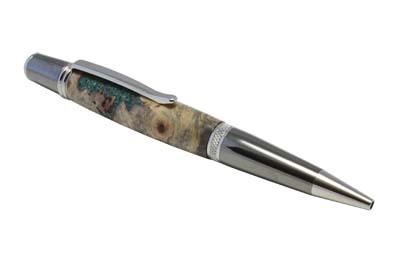 As well as its uses in turning and other forms of woodworking, it can be used with stone and gourd carving, etc. 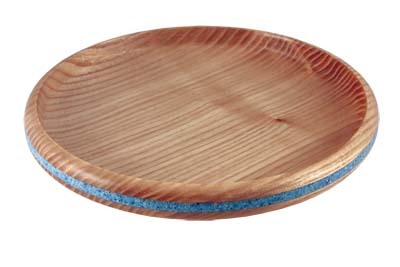 It has been available as a resource for woodturners for several years and although I have been aware of it, I have not made use of it until now. Here I share my experiences of using it for the first time. InLace is not difficult to work with, but there are some frustrations that I could have avoided and shortcuts that I could have taken that I've learned as I've gone along. I hope that other users may benefit from my findings. InLace is available in pre-mixed colours, in black, white and clear forms and in the form of 'nuggets' that can be added to the mixes. Also available are metallic 'dusts' in various colours and 'Thicken It' which, as the name suggests, is used to thicken the mix. The base material is also compatible with powder dyes. A starter pack is available which contains one 4oz tin of each of the pre-mixed and solid colours, 4oz of white nuggets, hardener, mixing cups and stirring sticks. I found that this, along with a jar of 'Thicken It' was all that I needed to get started, leaving the use of dusts and dyes for later. 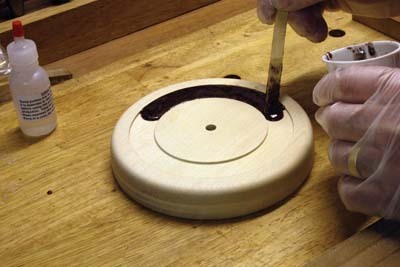 The first and most obvious use of the material is to create decorative inlays and in order to cover a range of options for this, I made a shallow bowl with an inlaid band on the outside, a clock with an inlaid chapter ring and a pen with inlaid wave patterns that were cut using the Beall Pen Wizard. I wondered how you got the stuff out of the tin without getting it everywhere? Pouring it out over the double lip of the tin was never going to be easy or controllable so in the end I resorted to spooning out small amounts with the wooden stirring stick. This proved to be effective, if a little time consuming, and also by counting the number of 'spoonfuls' required to fill a 1oz mixing cup, provided a useful means of measuring smaller quantities. 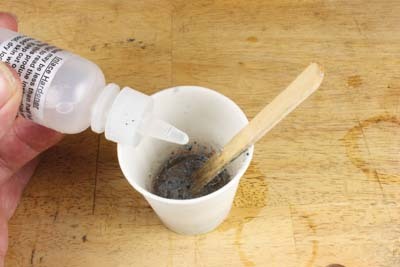 This is essential since the ratio of resin to catalyst is quite critical. Too little and the hardening will take too long; too much and the mix may not harden at all. The first project was the shallow bowl in ash (Fraxinus excelsior). After turning the outside to shape on a faceplate ring leaving a spigot on the foot for rechucking, I cut a shallow groove around the perimeter with a 6mm (1/4in) parting tool. Unsure as to the depth required, I erred on the side of caution and made it about 3mm (1/8in) but could probably have got away with as little as 1.5mm (1/16in). The next problem was how to fill the groove without gravity causing the InLace to flow out again before it set, the solution to which was simply to add a few flakes of 'Thicken It' so that the material was firm enough not to flow too readily. Two further issues arose here, firstly note before you take the lid off the jar that the 'Thicken It' is a very light material and will blow about easily so take care not to inhale it or blow it away by breathing too hard on the jar, and second, the viscosity of the InLace material varies between colours, so getting the thickness right is initially a matter of trial and error. I found that about 1/2 oz of InLace - to which I added 15 drops of hardener - was sufficient to fill the groove in this 150mm (6in) bowl and filling the groove was easily done using a stirring stick. I overfilled the groove slightly and took care to remove any trapped air pockets. After 12 hours the InLace is hard enough to turn and works easily with normal HSS tools. Once shaped, the outside was sanded down to 400 grit and then polished on a buffing wheel with white diamond compound followed by carnauba wax. InLace can simply be polished and does not require a finish but is compatible with most wood finishes. 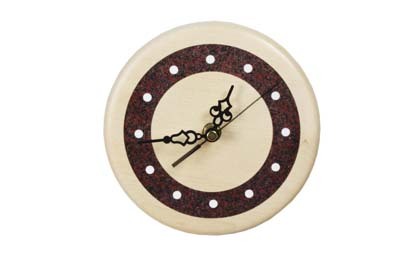 The clock project which was made from poplar threw up fewer challenges; the chapter ring being on the face could be filled laid flat on the bench without the need for thickening, the only caveat being the need to carefully remove any air bubbles. The surface of my chapter ring is slightly less than perfect as a result of my failure to do this. Once this first inlay was dry, I remounted the piece and drilled 6mm (1/4in) holes through the chapter ring to mark the hours, using the lathe's indexing facility and a Robert Sorby precision boring jig. These holes were filled with white InLace and left to harden. Working with InLace is not for those who are in a hurry; so far this project had taken two days, mostly spent waiting for the InLace to harden. Finally the finished inlay was turned flat and the whole piece finished as for the bowl. I was rather pleased with this clock and made another from ash, without the chapter ring but with the hours marked by black InLace inlays made in the same way as the white ones in the poplar clock. The final inlay project was the pen, from which I learned that the grooves for InLace really need to have vertical sides, especially if they are shallow, as they inevitably must be in a pen barrel. My first effort had grooves cut with a core box cutter which left a shallow 'U' shaped groove, this proved inadequate and when sanding the inlay it simply slipped out of the grooves. A second attempt using a straight cutter was more successful. 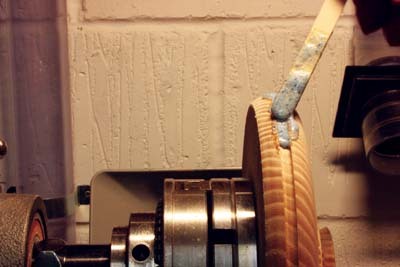 Spindle work such as this also requires the use of 'Thicken It' to allow the whole item to be inlaid at once or else several fills will be needed turning the piece perhaps a third or a quarter of a turn each time, which will extend the time taken for the project considerably. In addition to the inlaid projects, I also cast a small blank from a mix of black InLace and white nuggets. The manufacturer's instructions suggest casting using the 4oz mixing cup, but at almost Â£18 for a 4oz tin this makes for a rather expensive pen blank. Instead I used a 4oz mould intended for clear cast resin work and part filled it with a mix of 2oz of black InLace and 1oz of the white nuggets. 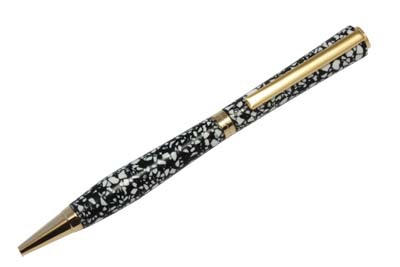 This is still not a cheap way of making pen blanks but the results are not unattractive and show potential for further experimentation, perhaps with polyester resin and dye rather than InLace. Finally, in order to try using the InLace for void filling, I took an otherwise unusable offcut from a buckeye burl pen blank and filled the extensive voids in it with InLace material. To do this I made a formwork around the blank with duct tape to stop the InLace from flowing away. 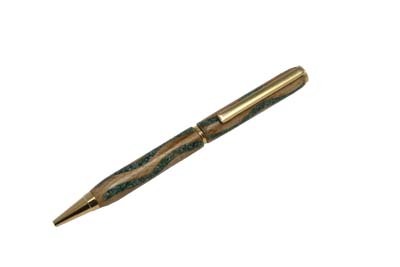 Once hard and turned this makes an attractive pen and I can see much potential for recovering otherwise unusable timber by filling the voids with InLace or even with other forms of coloured resins.